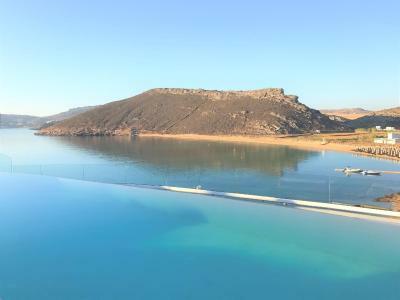 Lock in a great price for Panormos Village – rated 9 by recent guests! 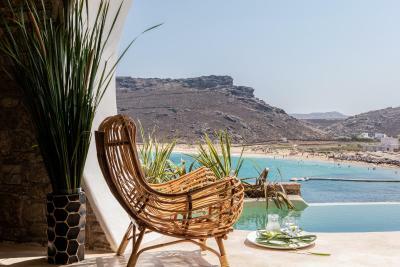 The hotel is set in a perfect position above a sandy beach and cove. The hotel is family run and makes for a lovely personal experience. No request was too much trouble. 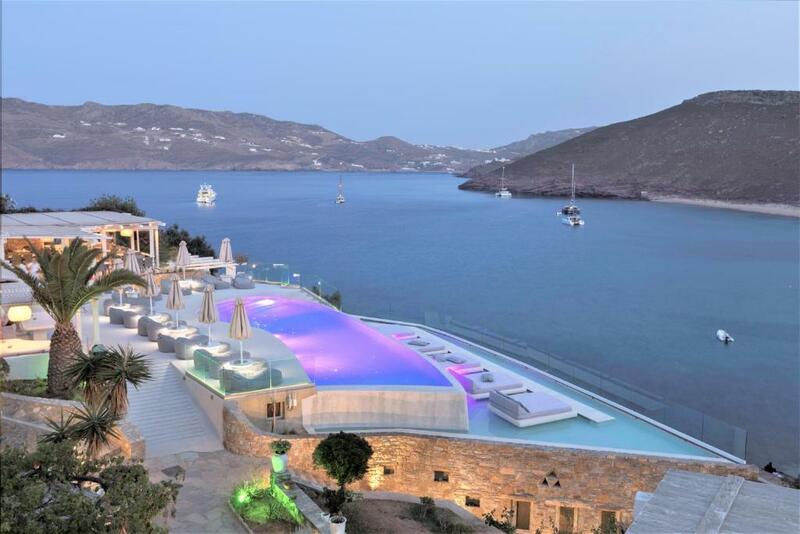 If you can, try to book the suites with the private pool. The view and privacy are worth it. I loved that we got to upgrade to one of their new villas. We had a private pool and patio which had an incredible view. 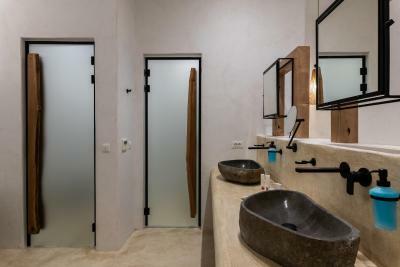 We also had two bathrooms for three girls which was a necessity. Lovley room, pool was beautiful, never too busy , excellent views. Very clean , big swimming pool , excellent staff and just a walk away from the beaches . Everything was perfect. People are welcoming and very helpful. The room was very clean with a nice and romantic see view. 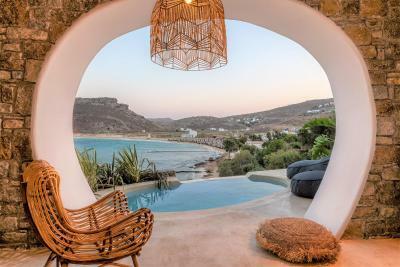 We went to panormos for a honeymoon and we will for sure come back very soon. The location!! Although we had to take a taxi into town the property is right by the beach, which is what we wanted. The view was beautiful!! Room was clean only complaint was the ac didn’t work but not a big deal. 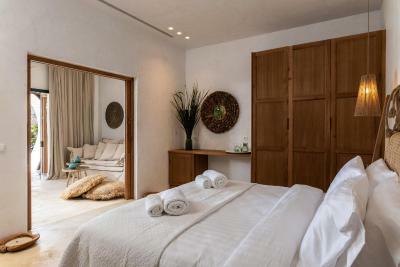 Everything, the hospitality, the room, the pools, the customer service, the beach, the view, a quiet and a peaceful place. everything was awesome. Me and my wife loved the hotel. It was what we wanted. The best vacation ever!!!!! 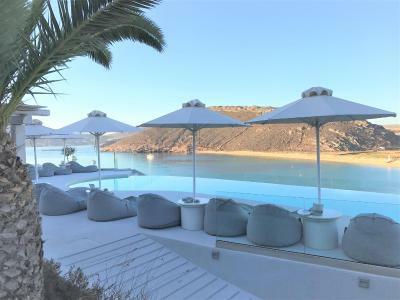 Panormos Village This rating is a reflection of how the property compares to the industry standard when it comes to price, facilities and services available. It's based on a self-evaluation by the property. Use this rating to help choose your stay! 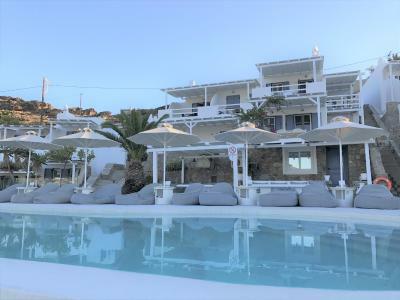 Hotel Panormos Village is a resort located directly on the seafront on the north coast of Mykonos Island, with a sea-view outdoor pool overlooking Panormos Beach. 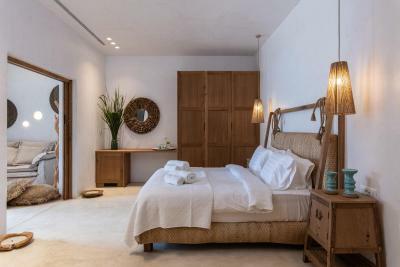 The Cycladic style rooms and apartments with private verandas are surrounded by gardens, with vine-covered pergolas offering natural shade. All accommodations types are fully equipped with air conditioning, coffee making facilities, fridge, satellite TV. 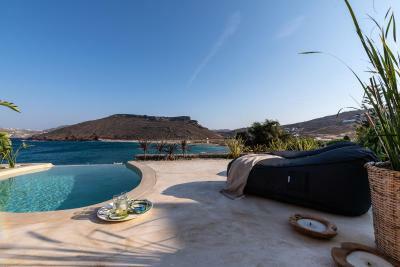 Guests can bathe at the pool and enjoy the view having a drink or a snack. Buffet breakfast is also served by the pool. 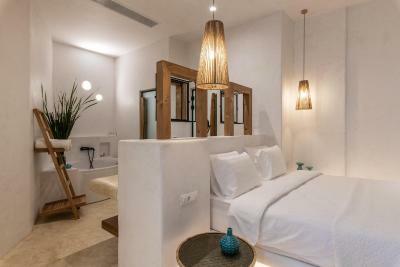 Free wireless internet access is available on all terraces and balconies of the rooms and apartments. 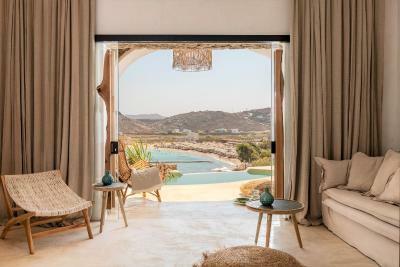 Panormos is located only 10 minutes away from the bustling Mykonos City where you can find plenty of chic restaurants and bars. 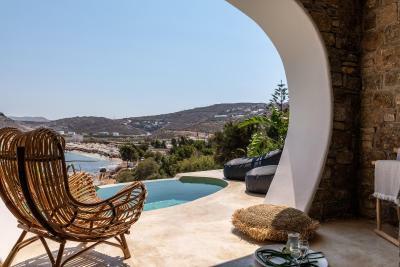 This property also has one of the top-rated locations in Mykonos! Guests are happier about it compared to other properties in the area. 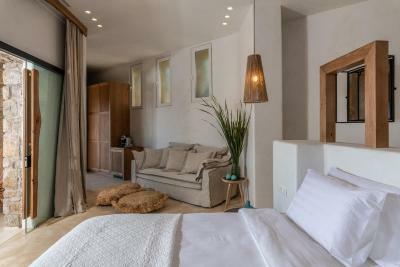 When would you like to stay at Panormos Village? 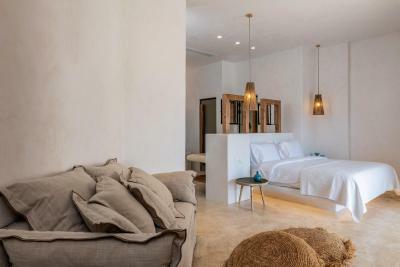 Opening to a terrace with views over Panormos Bay, this apartment features 2 sofa beds, a bedroom, a well-equipped kitchenette and a bathroom. 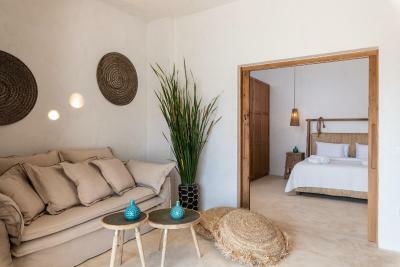 This unit consists of two rooms, one with a double bed and another room with two single beds. 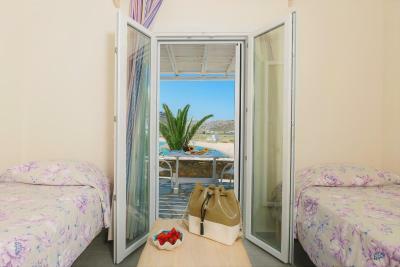 Very elegant room with modern furnishings and views to Panormos Bay. 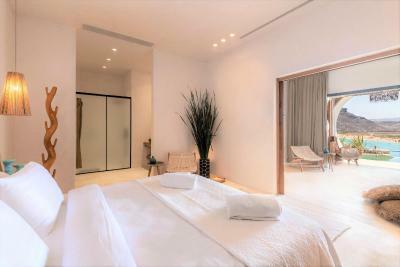 Elegant room with modern furnishings featuring an infinity private pool facing Panormos Village. 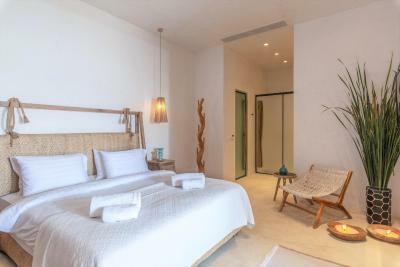 Modernly decorated double room with private entrance and air conditioning. Please note that this room type only has a window on the door. 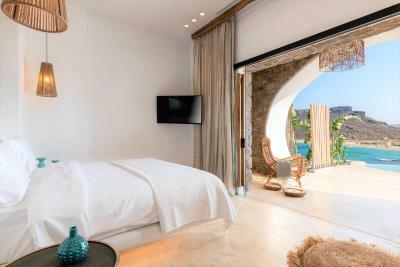 Featuring traditional Cycladic decor, this junior suite has a round balcony with views over the Aegean Sea. 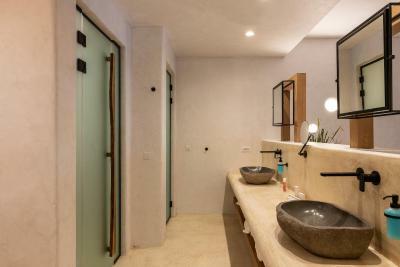 House Rules Panormos Village takes special requests – add in the next step! Panormos Village accepts these cards and reserves the right to temporarily hold an amount prior to arrival. Please note that laundry and ironing services are provided at extra charge. Please note that free transfer is offered for stays of more than 1 night and is available daily from 09:00 to 22:00. Please note that for 1-night stays, transfer is provided upon charge. The water of the swimming pool was extremely cold. 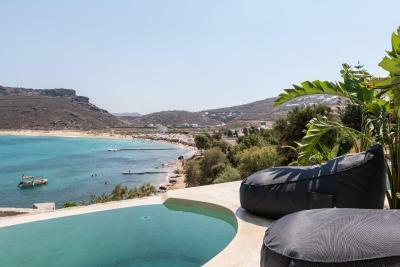 We’ve stayed 5 days in Mykonos, and visited almost the entire island with a rented car, but we can say that Panormos Village has the best service from Mykonos! Best service in the rooms, pool and restaurant. Panos and his colleagues are very friendly, helpful and always full of energy! Breathtaking view from rooms, pool and from the restaurant! The whole place is built oriented to the golf, really has a fancy air. 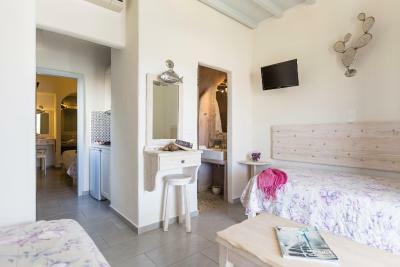 Clean rooms, friendly and very responsive staff, excellent food at the restaurant, our room (213) had cooking posibility (electric stove, kettle, coffee maker, sandwich maker, fridge, plates, forks etc). The water in the shower has a softening system, never seen that before. 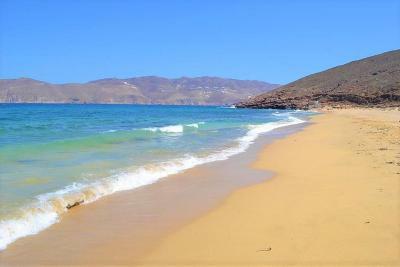 Panormos beach is close to the hotel, it has one of the softest sands in Mykonos, and is one of the longest. Totally recommend. The staff were lovely and friendly. Our room (501 - the newest part of the hotel) was absolutely beautiful. Couldn't have asked for a more perfect aspect. 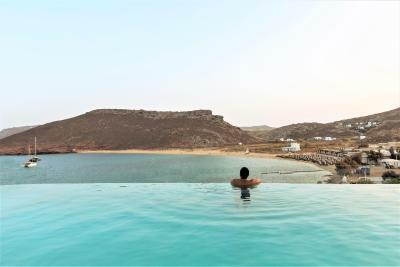 It overlooked the bay and had its own private pool. We ate plenty of good food - fresh fish and lots of greek salad. We had a very relaxed and happy stay here. The room we were given was on the back of the hotel with no window. The hotel itself is really nice with great views. The pool area was also very nice to spend your day. This hotel was amazing!!! From the moment we arrived we were greeted by the staff and taken to our room, we were upgraded for free to a week old suite with a huge terrace and pool, just amazing, we didnt even ask for the upgrade but it was so thoughtful of the staff to do this for us, it was maybe because it was our honeymoon and my wifes birthday! 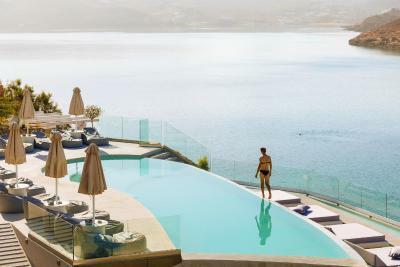 The hotel had a very family run feel to it, the staff seemed so appreciative of everyone who stayed with them and they were so friendly, its a great location with amazing views overlooking the cove and beach. 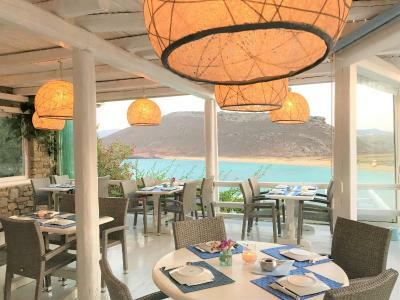 The staff were absolutely amazing and the location is perfect. We thoroughly enjoyed our experience and will recommend it to all of our friends. Some staff was nice but others weren’t friendly at all. It is also costly to go back and fourth from the town which was annoying. Staff seemed surprised at solo traveller (even though it said on my booking) . Cool welcome from reception but after that staff wonderful.